I always liked trying out the newest test gear. While I was still a tech, we were mandated to use P25 ‘digital’ equipment (even though it didn’t work very well around here) and of course needed the gear to test it. The small IFR (Aeroquip by then) with with a nice display and loads off goodies was wonderful when flying to mountaintop sites. Most was lower frequency (~160.xxxmHz) with some lisenced 900 point to point. BUGSBUNNY - I am in the same jealous camp now too because I only get to visit Silicon Valley once a year if I am lucky, to check out the latest. If it didn't take so long to drive there from LV, I would visit every month. HP retirees have a gold badge (literally, colored gold) which allows us normal access to non-sensitive areas. I always liked trying out the newest test gear. LOTUS54 - I am a sucker for new equipment, especially bleeding edge tech. I guess having done prototype work in HP has made me accepting of newest gear. It is risky at times, especially now that I have to buy my own, but also rewarding when you Beta test something and then become instrumental in helping make it better. Yet another comment that does not lend itself well to Social Knowledge LLC's thread structure. This right here is the most recent and arguably the most relevant of the cellular booster threads, so I'm going to put it here. Along with your booster, you're going to need cellular signal receivers into which the signal is to be boosted. You might be OK just with your phone, or you might be like me, in need of additional options. In 2018, possibly in anticipation of the 5G roll-out, cell providers backed off the model of the cheap air card add-on. In addition to my phone, I have a Verizon Netgear hotspot that costs me $20 per month - very reasonable for the amount of usage it gets. It makes sense for me to pay for that add-on. These whiteholes are beyond aggravating. I need to maintain connectivity for work purposes, so "no cell coverage" is unacceptable. AT&T has coverage in those whiteholes, and my husband is an AT&T cellular subscriber. But AT&T now wants $50/mo plus $200 in equipment charges for their air card equivalent of what I already pay for with Verizon. Financially it makes no sense. That's more expensive than buying unlimited high-speed cable for your stick-and-brick. But AT&T is now offering their Mobley device for a limited time only, for the sought-after price of $20/mo. We have one on order. It is designed to work in a vehicle's OBD port, but there are conversion devices that can be used to power it from USB. I'm researching that this morning. The device is obviously not hassle-free, but for the price, I will consider working with it. Anyway, for work purposes, vendors such as Cradlepoint have always argued to me that I need to maintain both Verizon and AT&T in my kit bag. I've been trying like hell to get by without paying charges to both providers. This might be a reasonable compromise. INTERBLOG - Sounds like ATT Mobley is a great cheap way to get if you are able to figure out the hassles associated with said sleep-mode when engine is turned off. Can't get any better for that price. If I was not already tied semi-permanently to Sprint via my son-in-law's employee plan, I would consider buying this or other dedicated hotspot for the rv & our highest mileage daily driver. Keep posted how it works. If there is a good way to keep it running while rv is docked in place and ignition off, I may get one myself. Our Sprint Employee Wireless Advantage Club Program is $30 per line (unlimited data, unlimited talk & text in Mexico/Canada), Global roaming, Hulu, Tidal, HD stream @ 1080, no throttling until after 50GB and each phone has 50GB of mobile hotspot. So we have at least 200GB mobile hotspot per month. Way more hotspot than we ever need. While Sprint isn't the best nationwide, it works really well in my local area and most places we frequent (so far). One of the things we do is dedicate our old S7 phone as our mobile hotspot rather than tying up our personal phone in hotspot/tether mode. For $30, it is much cheaper than any provider's hotspot data plans. While 50GB/phone hotspot is not unlimited, we never gone over even with grandson's primary usage being YouTube & Netflix at Low Or Medium setting (300MB/hr.) while in minivan or rv. And if we ever max out, we have all the other family members 50GB hotspot to switch if if ever necessary. Having the SureCall Fusion2Go (RV version) works really great with this too, because it services the entire rv and all it's phones without issue much better than the standard vehicle single user version. I read in SignalBoosters that this RV version supports up to 4 devices. But that is not anywhere in the SureCall docs. We have certainly gone beyond 4 devices and noticed no issues. Not sure where SignalBoosters got that info from. 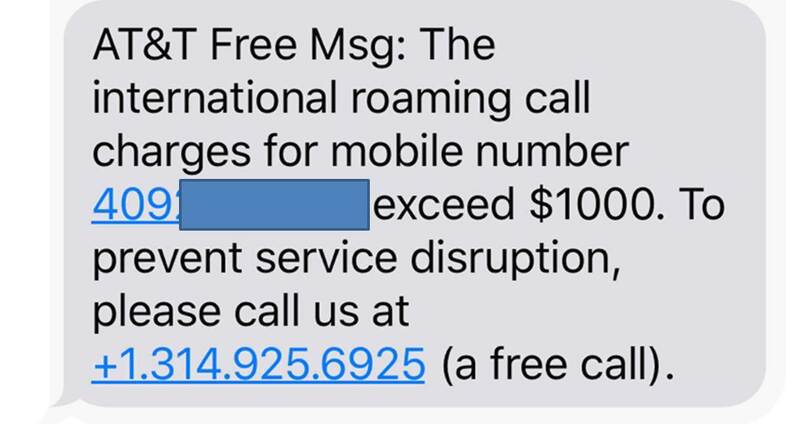 LB_3 just stumbled out of bed and announced that AT&T (or someone pretending to be) informed him via text message that our new Mobley has already racked up over $1,000 in international roaming charges. Except we haven't even activated it yet. And the physical device is here in our house, not in some international location. Something stinks with this deal, obviously. Even if the St. Louis phone number rings through to a scammer, how did they acquire my husband's AT&T account information, which they clearly have? AT&T confirms that the debt is real. The Mobley was shipped to us with massive debt pre-loaded. My husband had to go into a work meeting, but he is working on a resolution. Edit: To clarify what Richard said above, that number is commonly spoofed. The St. Louis number is actually an AT&T customer service number. But scammers may use it to spoof people. In other words, they are not calling from that number, but they have hacked Caller ID to make it LOOK as if they are. Whenever you get a txt like that, ignore the text and log directly onto your account to see whether anything is actually going on. Do not, under any circumstances, call the number provided in the text message. Correct. That is what my husband did. That is how he confirmed that AT&T (the REAL one) does believe that he owes this massive debt for a device not yet activated by us. Meanwhile, please share what you learn, (e.g. how in the world this happened and how quickly they are fixing it for you). Allegedly, the group selling the Mobley is fraudulently placing additional cellular lines on some buyers' AT&T accounts at the same time as they are adding the legitimate Mobley line to those accounts. They then proceed to rack up extreme charges on the buyer's account before they are detected and shut down by AT&T. Very sorry you guys had to go through this... I was about to place an order... yikes! INTERBLOG - Sorry to hear this horrible outcome. Hope all got straightened out. Bad news for AT&T. I wonder how AT&T could let this happen on their legit product & promo this long. There must be lots others since yours was ordered much later than the original promo letter stated in the video.